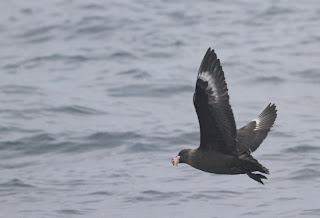 Memorial Day, Frigatebird & Kites! I know that many people like to read a daily update on the highlights of Cape May, so I must apologize for the huge gap in postings, brought about by the unfortunate coming together of a very full and hectic (though very enjoyable!) Cape Maygration, Memorial Day weekend and the need to take a few days off. From a 'highlights' perspective, it's actually been something of a quiet period over the last few days, as spring migration winds down and breeding birds gradually lose voice as they begin feeding young in the nest - some resident species starting second broods now too. The really awesome news though, involved a female Magnificent Frigatebird seen high over Cove Bay with a party of vultures! Unfortunately - as is so often the case with such things - the bird was seen at the southernmost tip of the county and was heading south - not much opportunity to chase after it unless you were already in Delaware! I believe that Bill Roache was the finder. As is also so often the way with such things, I received a later email confirming an earlier sighting of what was likely to be the same bird. Elizabeth Tizzie Cregan sent me word of a frigatebird she had seen flying over the Manasquan River up in Monmouth County, just east of the Route 70 bridge on Saturday afternoon. For those of us less blessed with good fortune, there were still plenty of other nice birds to be enjoyed, not least the Mississippi Kites, which continue to put on a fabulous show at Cape May Point this year. Maximum counts included seven on Sunday and eight on Monday, with birds doing repeated tours of the point and giving plenty of opportunity to enjoy them. Reeds Beach continued to attract the lion's share of this year's Red Knot and several people reported some of their best views ever of the Horseshoe Crab/shorebird spectacle that is one of the natural world's greatest wildlife shows and takes place annually right here on our doorstep - hopefully for many years to come. Red Knot numbers are worryingly down again this year and research into the reasons for this continues. Belleplain is slowly winding down as leaves get more dense and make it ever-easier for songbirds to remain hidden. However, I made a quick run up there on Saturday morning and Louisiana Waterthrush, Prothonotary Warbler and Blue-winged Warbler were all still singing and Summer Tanagers continue to pop up and sing in excellent numbers (I hear that Don Freiday had eight recently). Other birds in good numbers - at least at places I've been visiting - include Yellow-breasted Chat, Yellow-billed Cuckoo and Great Crested Flycatcher. With the heady days of summer come the butterflies and dragonflies; Villas WMA yesterday was alive with dragonflies and I saw my first-of-year Painted, Slaty and Spangled Skimmers, as well as lots of Calico Pennants, Carolina Saddlebags and Blue Dashers, a few Common Whitetails and still a few Blue Corporals. Finally - a Roseate Tern paid an all too brief visit to the South Cape May Meadows on Friday morning, which reminds me that we're entering the time for real oddities to turn up (such as the frigatebird!). Keep an eye out for unusual birds where ever you are in the next couple of weeks and keep an eye on the bay for Wilson's Storm-petrels which are just starting to show up now. The meadows in particular are good at the moment as water levels have dropped massively with the end of the road work in neighboring streets (outflow pipes had been temporarily blocked to stop flooding of the work site) and masses of Semipalmated Sandpipers, up to four White-rumped Sandpipers and small numbers of Least Sandpipers and Short-billed Dowitchers have been present this weekend. With a Little Egret reported from neighboring Delaware recently, it seemed like a good move to go and check out the Snowy Egrets in our neck of the woods, just in case there was an odd looking bird lurking out there somewhere! I took a gamble on one of the nearby creeks lunchtime and found a nice collection of some 45 Snowy Egrets, one Green Heron and a nice collection of Forster's and Least Terns, all tucking into shoals of tiny fish trapped in the shallows. Perhaps inevitably, all the egrets that I could see were Snowies, but it's a timely reminder to keep an eye out for that odd bird that just looks a little different to the rest. How best to do that? Learn your common birds! The better you know the regular birds in your area, the more likely it is that you will spot the oddball when it shows up. A closer look at a Snowy Egret in breeding plumage. At any time of year, Snowies have yellow lores (the bit between the eye and the bill!) while Little Egrets are bluish or gray in this area for much of the year. When in full breeding condition, Little Egrets are yellow on the lores too, so it's then best to look at the ornamental plumes; Snowy Egret back plumes are curled, and they have a shaggy crest on the back of the head. Littles have straight back plumes and just two long, thin plumes on the back of the head [photo by Mike Crewe]. Tom Reed found a nice female Wilson's Phalarope in The Meadows yesterday afternoon, which lingered to this morning at least. Karl Lukens managed a digiscoped image of the bird, which remained rather distant at the back of the pool. and a report of an American White Pelican flying over Nummy's Island on Tuesday - but no further sightings that I'm aware of so far. On Wednesday a Mourning Warbler was seen (and heard singing) briefly but well at the Northwood Center but could not be relocated by those looking for it later. A distinct warming of the weather has brought out a wealth of dragonflies and butterflies this past 24 hours or so - time to get out and enjoy this coming holiday weekend! 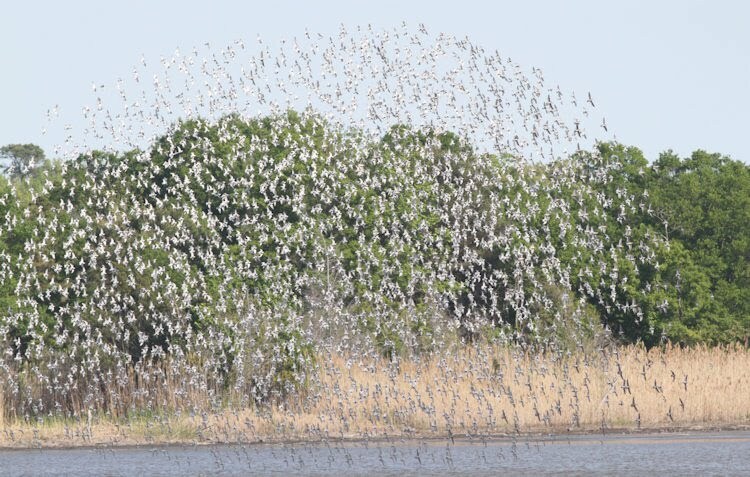 As our week-long Cape Maygration festival of spring birding draws to a close on its final day, it seems appropriate to look back at some of the highlights we've had over this past week - and to apologize for those missing daily posts on the blog - we've just been so busy out there in the field!! Despite threats of rain every day of the festival, the weather stayed largely dry and it was only really on Monday that we got rained out on a couple of morning walks. Considering that it was a quiet year for migration this year (due to weather conditions) and considering that we don't actually go out of our way to record as many birds as possible, it is testament to the great birding around Cape May that a total of 190 species was recorded by Cape Maygration participants during the course of the week. That's pretty spectacular! As Program Director, I have the very enviable privilege of working with an amazing army of people who give up their free time as volunteers for Cape May Bird Observatory and I want to pay tribute to them all here, for without them, we simply couldn't run these events. Thank you all of you, you are truly awesome! And so to the week's highlights. Tony and Tom have already covered the pelagic trip below and made those of us who couldn't go supremely jealous. With up to 50,000 shorebirds at Heislerville this spring, Cumberland County did us proud too and those who went on the programs there enjoyed Curlew Sandpipers and Red-necked Phalarope as well as all the commoner shorebirds, roosting night herons and Lesser Scaup. Belleplain State Forest gave up some superb birds - Summer Tanagers in particular seem to be showy this year, while a fall of warblers up there on Saturday ensured that rainbow colors were enjoyed by our participants. 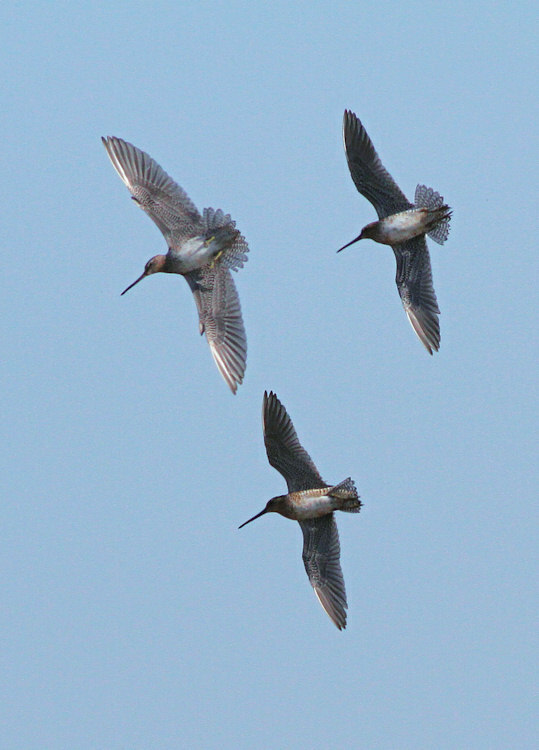 Moving down the peninsula, the back bay boat trips and kayak birding gave people plenty of opportunity to get close to some great flocks of shorebirds, lingering Brant and seemingly endless photo opportunities with Clapper Rails! On the bayshore side, the shorebird watches at Reeds beach produced some of the most spectacular shorebird watching bonanzas that I personally have ever witnessed. Seeing Red Knot so fat with horseshoe crab eggs that they look like little beer barrels almost brings a tear to the eye - you know those guys are going to make it this year. The kite watches? Well, of course it was a gamble, you never know what the weather is going to do, but we hit the jackpot, with Mississippi Kites on all but one of the watches and some days we scored five birds together! With eyes on the skies, other highlights were had too, not least of which was the sight of an adult Bald Eagle talon-grappling with one of last year's youngsters! As well as the walks, we had the indoor programs too, with a great range of topics covered and a great wealth of knowledge imparted from some of the region's most accomplished naturalists. We hope you enjoyed it and we hope you come back soon. And if you couldn't make this year, we'll see you at the next one - and hey, there's Autumn Migration to look forward to as well! We were grateful to Gladys the Glaucous Gull for hanging around all week at 2nd Avenue Jetty and becoming a life bird for many people this week. Not sure what fish it's eating but, with a little help from Bob Lubberman (thanks Bob!) I reckon it looks like a Smooth Dogfish. As well as the shear pleasure of just birding, we of ocurse offerd a range of photography courses, which are grwoing in popularity with the ever-growing ease of digital photography. This was just one of several grteat shots obtained on one of Mike Hannisian's photo walks this week. 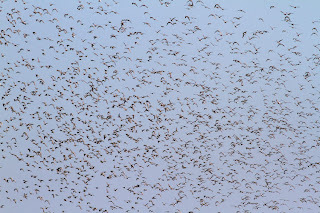 Our local Purple Martins certainly get plenty of coverage! One of the least-expected birds this week was this Purple Finch which made it onto the list courtesy of Mike Hannisian's yard feeder during a photo course! Just in case!! Just in case there were no kites at the Beanery Kitewatches, Dale Rosselet came prepared with one of her own (and yes, that is a picture of a penguin on it!!). Tony's previous post does a good job summing up our day at sea, and includes some excellent photographs. Here's a little play-by-play of the trip, along with a cumulative list. At 11pm, we left the dock in Wildwood Crest. The ride out was a bit choppy, and we encountered several brief and light rain showers. At 4:00am we arrived at our "destination" on the edge of Wilmington Canyon, about 80 miles offshore. The mate started chumming in order to develop a slick behind the boat, with the hope of attracting birds. The first Wilson's Storm-Petrel flashed by not long after, visible in the light generated by the boat. More and more appeared as dawn approached. By the time we had full light, there were several dozen Wilson's viewable around the boat. The day's first shearwater, a Sooty, zipped by in the distance, but was soon followed by an extremely close bird that came in to feed with the storm-petrels. A Great Shearwater made an all-too-brief appearance a few minutes later, followed by a Cory's Shearwater a few minutes after that. Our storm-petrel flock had increased to close to 100 birds, but with a lack of anything else interesting, we decided to move on. At about 8:00am, Glen Davis picked out the day's first Leach's Storm-Petrel flying ahead of the boat. This soon turned into two birds, and were the first of an impressive 16 individuals seen for the day. Unfortunately, aside from a constant show of storm-petrels, the occasional Sooty Shearwater, and an impressive acrobatic show from a pod of Offshore Bottlenose Dolphins, we couldn't find much else the rest of the morning (rough, I know). By mid-day, we had to turn back toward shore to try to get back by the intended return time of 5pm. However, this ended up being much easier said than done. The birding doldrums ended when Paul Guris came across a large, dark tern flying a few hundred yards out. Consensus was reached that the bird was a Bridled Tern, potentially constituting a first spring record in NJ waters. Almost immediately after, phalaropes were found on the water amidst a patch of sargassum weed. Both Red and Red-necked Phalaropes made up a mixed flock of almost two dozen birds. Also at about this time, a Chimney Swift flew over the boat! Multiple observers converged on at least one Arctic Tern, and there were likely a few others, but many of the terns we saw were outside of ID range. The seas started to lay down during the afternoon, helping us find several Sooty Shearwaters on the water, along with a large mixed flock of almost 60 phalaropes. One of the day's most exciting moments came about 50 miles from shore, when a South Polar Skua came charging in from behind the boat. Mike Fritz tossed it a fish, which it gladly stopped to chow down on, and which also caused us to quickly turn the boat around to get a good look! As we got closer to shore, Tony picked out a high-flying Black Tern overhead and a few more Sooty Shearwaters appeared. We ended the day with a Purple Sandpiper on the south-most Coast Guard jetty, along with several flocks of Whimbrel in the back bay marshes near the dock. It was a remarkable day to be out on a boat- one that would be very difficult to match, and equally difficult to forget. 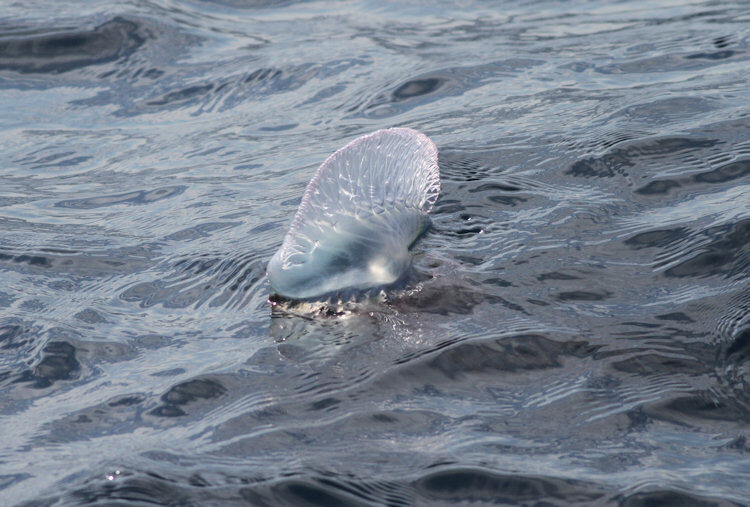 Notes: Pelagic trip; part of NJAS Cape Maygration festival. Other notable sightings: 20 Portugese Man O'War; 20 "Offshore" Bottlenose Dolphins; 12 Common Dolphins; 1 Minke Whale. 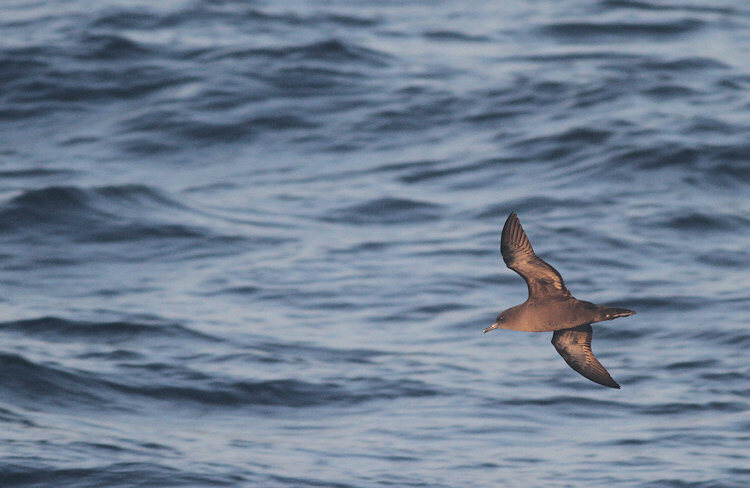 Cory's Shearwater 1 seen early in AM, about 80 miles offshore. Perhaps a bit early. Leach's Storm-Petrel 16 First found around 7:30am at canyon edge. Some by themselves, others in "pairs" or mixed in with feeding flocks of Wilson's Storm-Petrels. Double-crested Cormorant 1 Very bizarre; single bird about 70 miles offshore, flying toward the SE! Red Phalarope 66 Found both times in mixed flocks with RNPH, and in same general "zone" offshore. 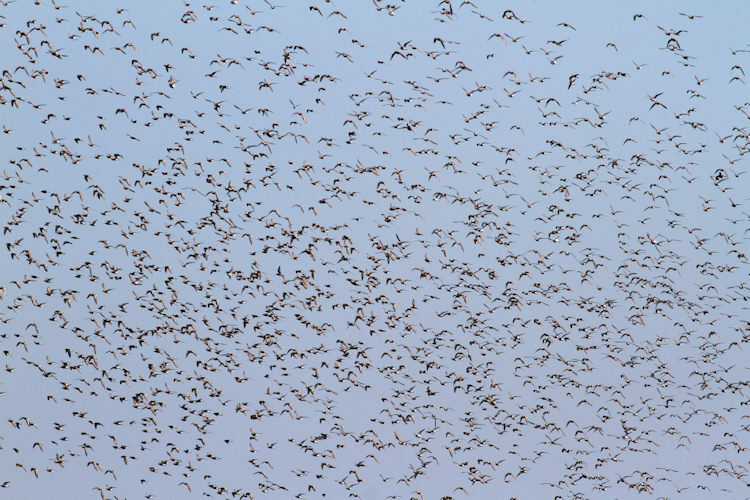 One flock contained 49 individuals. Bridled Tern 1 **Very rare** - Possibly a first ever spring record for NJ. First-summer bird, with pale forehead and pale belly, overall dark-gray tones to upperside and wings. Arctic Tern 1 possibly more. South Polar Skua 1 Barreled in behind boat and landed in slick. A fish was thrown to it, and we were able to circle back and have lengthy, close looks. Not an adult; not sure how to age. First Cape MAYgration pelagic trip a resounding success! In past Spring and Fall events run by the Cape May Bird Observatory, which were "just" weekend events, there was no time in which to run a real pelagic trip. The "Poor Man's Pelagic" trip, a trip over and back on the Cape May-Lewes ferry, was a feature of most of those events and were always well attended. This Spring, we made a change. SeaLife Paulagics organized a pelagic trip to Cape May County waters on the Atlantic Star that departed around 11 pm on Thursday night and returned shortly before 6:30 pm Friday evening. We even scored one species with "pelagica" as part of its scientific name: Chimney Swift (about 75 miles out)! I will leave to Tom Reed the numbers aspect of the reporting of the trip, but will steal at least some of the thunder by presenting a few pictures from the trip. Because it was a "real" pelagic trip on a chartered vessel, we could chum for birds, resulting in extremely good views of numerous species, including the above picture Wilson's Storm-Petrels. 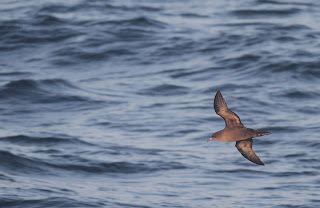 And the below Sooty Shearwater (one of many seen). ... and a goodly number of pretty pelagic phalaropes. Interestingly, and perhaps predictably, we saw the most action when we were on our way in, trying to make the scheduled 5 pm return. It seemed that the ocean did not want us to leave, so kept throwing interesting things our way, including our only whale of the trip, a briefly seen Minke Whale. Of course, we were obliged to slow our passage or, even, turn around in order to enjoy these treats. Every Cloud Has A Silver Lining, so there's a lot of silver around Cape May this week!! Yes, the weather isn't being overly ideal for our very first Cape Maygration festival, but judging by the smiley faces this morning on our Beanery walk, the weather isn't spoiling the fun. And that's because the birds are just great! If you couldn't make it this year, we're sorry and hope to see you soon; if you chose not to come - here's some of what you're missing! Morning walks have largely been very successful in finding some great birds and - just as importantly - missing the rain! (To be honest, we've dodged the worst of the weather so far, which often happens here at the point).The one sad thing is that the weather continues to keep migrants to the west and a Cape May spring fall just hasn't happened this year, but the shorebirds have been spectacular and I particularly enjoyed my three-hour session on the Shorebird Watch at Reed's Beach with Steve Weis, which gave our visitors some great views of the activity around the Horseshoe Crab egg-laying spectacular. Other hot news includes the continued residency of the first-summer Glaucous Gull at 2nd Avenue Jetty, up to three Mississippi Kites at various locations from Higbee's Beach south to Cape May Point, a Summer Tanager at The Beanery this morning (and good numbers singing at Belleplain too) and continuing great looks at Clapper Rails on the boat and kayak trips. Outside of our Cape Maygration trips, I hear news of the odd Blackpoll Warbler still around, a White-winged Dove on Thursday at Cape May Point and a Sooty Shearwater in The Rips Friday morning. This is why we love Cape May! The Reed's Beach jetty boils with Ruddy Turnstones, Dunlin, Semipalmated Sandpipers and Red Knot [photo by Mike Crewe]. A little further afield, Kevin Karlson sent me this photo of one of the two Eurasian Whimbrels that have been showing of late up at Bringatine. Note the trademark white rump and lower back of this Old World bird - which may some time be split as a different species from the North American Hudsonian Whimbrel. Beth Polvino takes some great portrait shots of birds, but occasionally you like a shot that offers something more - here, Beth photographed a Clapper Rail in mid-wash which gives a wonderfully surreal image! 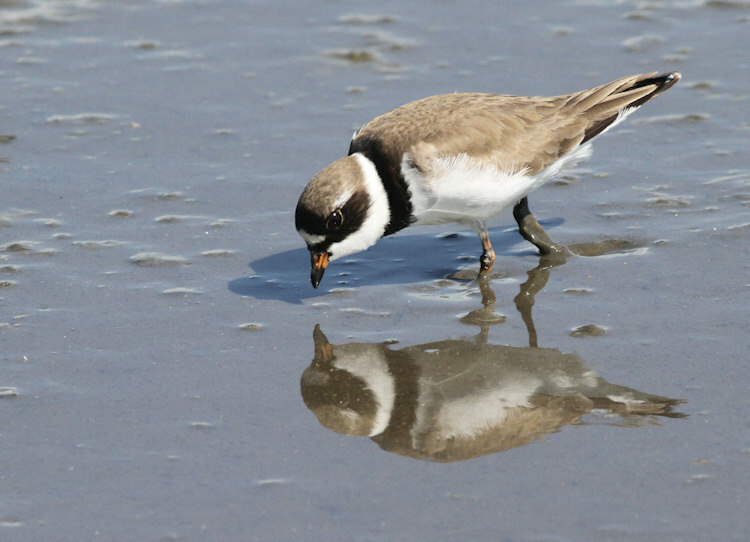 If you're coming down to our walks at Cape May Point, the beach offers great opportunities for birding. There's plenty of terns to enjoy, with Least Terns nesting on the beach and Forster's Terns fishing in the ponds. Least Tern at South Cape May Beach [photo by Karl Lukens]. 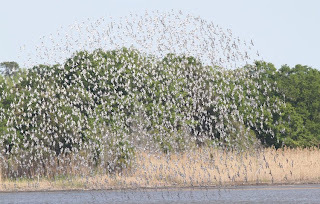 Drizzly rain that keeps pestering us and 'wrong' winds have been playing havoc with aspirations as birders move into town for the first annual Cape Maygration Festival, a week-long celebration of Cape May's birds that has grown from our Spring Weekend events. However, it's a pretty poor day when there's nothing to see around Cape May and this was typified by the Prothonotary Warbler that sang for most of the day yesterday, right outside the Northwood Center on the edge of Lake Lily. 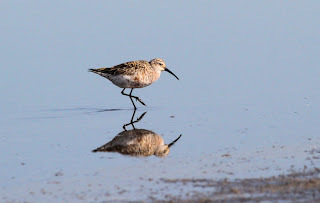 This time of year, attention turns to the shorebirds that pass through here in great numbers in May, so here's a quick celebration with some recent photos. Some great photos have been taken of Curlew Sandpipers at Heislerville over the past week, with at least four different birds being reported from there. Karl Lukens captured this shot at the impoundment on the left at the end of Matts Landing Road, which has been the best place for them this year. Try to be there on a high tide for your best chance of seeing one. Short-billed Dowitchers are plentiful in the backbays at present (particularly around Nummy's Island) but what was speical about this shot for me, was that Beth Polvino took it from a kayak. Birding by kayak is a regular part of our program this year and offers an opportunity to get into creeks and saltmarsh that aren't accessible any other way - who knows what you might find out there! To pre-register or find out more about our CMBO guided kayaking trips, call 609-884-3351. News from elsewhere includes reports of up to two Eurasian Whimbrel at Brigantine, the White-faced Ibis continues off and on at the south end of Stipson Island Road and up to two Lesser Black-backed Gulls are loitering around Cape May Point. The Glaucous Gull has reappeared at 2nd Avenue Jetty (after doing a vanishing trick for World Series day!) and Bob Fogg reported a Piping Plover on the beach at Norbury's Landing which is a little unusual that far up the bayshore side. Right now, the sun is trying to break through - let's get out there! If you want to see Clapper Rail - get in a kayak like Beth Polvino did to get this shot! Don Freiday sent me this great picture of Tom in one of his favorite places, the Cape May Hawkwatch Platform, where we all benefited from Tom's great wealth of knowledge gathered during a lifetime of birding. Hawk Counter Melissa Roach stands attentive. As the sands of time trickle by, the old impart their knowledge to the young. The Heislerville WMA in southeastern Cumberland Co. continues to please visitors. Josh Nemeth reports an alternate-plumaged female Red-necked Phalarope in the SW corner of the main pool as I type this. But, I now hear that Tom Reed found it yesterday while taking part in the World Series. I've received a report of three White Ibis heading east over Goshen Road heading toward Stone Harbor this morning around 7:30 am. 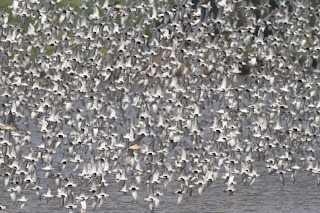 As has been true for the past, well, quite a while, the impoundments at Heislerville WMA in southeastern Cumberland Co. along the lower reaches of the Maurice River are THE place to see shorebirds in the state. 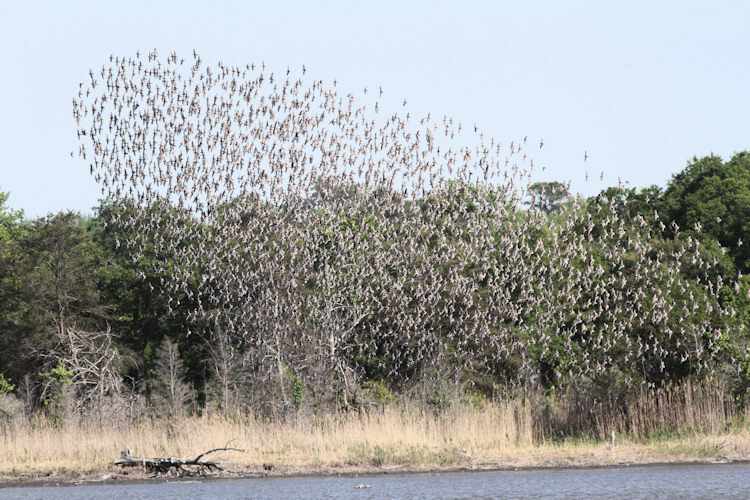 Oh, there MIGHT be more birds at some other places like Brig (Forsythe NWR, Atlantic Co.), but there's just no place like Heislerville in the state. 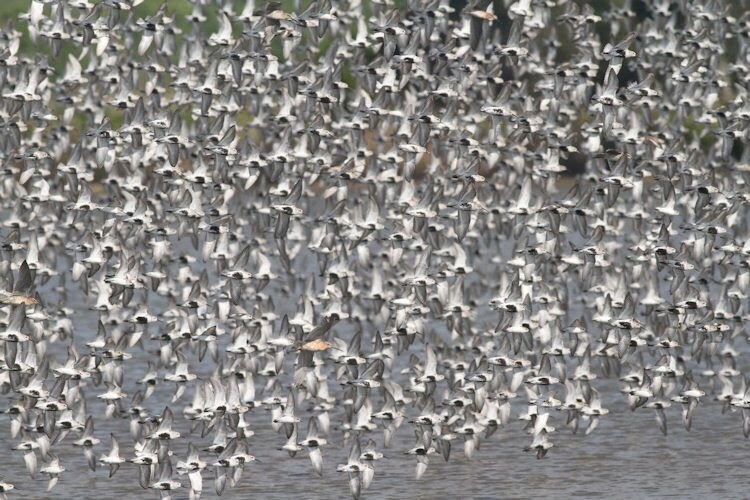 Not only can one go there around high tide in May and see 1000s if not 1000s upon 1000s of shorebirds, most of the birds are fairly close and also allow fairly close approach. But, for many birders, it's not necessarily the spectacle they visit for (though, that's my favorite aspect of the place), it's Curlew Sandpiper. I don't know how many years running that the site has hosted the species, but I know that it's at least four, because I've seen at least one individual of the species there each of the past four Mays. And not only is the species tallied there each year, but multiple individuals are tallied there each year. Though this year's count of at least four might not be the highest tally ever there, this year's showing might be the most interesting due the extreme range of plumage variation shown by the four birds. Though Vince Elia has apparently hogged all sightings of it, there is a spanky adult male in high plumage. There is a bird in virtually full basic -- or basic-like alternate -- that Chris Vogel found quite some time ago. There is what is probably an adult female (below) found a few days ago, but I don't recall by whom. Finally, there is a bird (below) that I found on Wednesday (11th) that is either an immature male or an adult male that is nowhere near as far along in its prealternate molt as is the spanky bird. 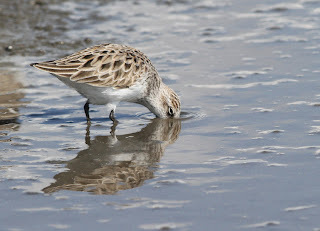 For those searching for the species at the site, pay attention to the different foraging patterns of these birds than that of the ubiquitous Dunlin. Yes, they can be hard to pick out of the Dunlin (though those really red ones tend to stand out), but they really don't forage with the Dunlins. Oh, they roost with them, but they tend to forage with the Semipalmated Plovers and Semipalmated Sandpipers on the mud side of the edge of the water. Obviously, they tend to stand out amongst those smaller species. Finally, though they can and do probe deeply with that long bill, they have a tendency to pick or to probe shallowly. But, as I wrote above, I'm more fond of the place for the spectacle than I am the rarities. 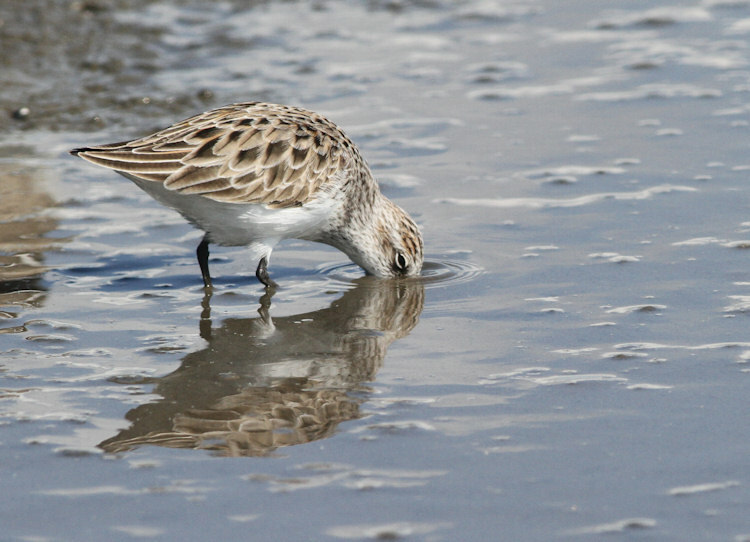 (Though don't get me wrong, if a Broad-billed Sandpiper shows up there, I'll be there in a flash! For those on the text-messaging system here in Cape May, the Bird Banding Laboratory hasn't assigned a 4-letter code to the species, so you'll probably want to spell the name out, because there is conflict with Buff-breasted Sandpiper!) So, to push my favorite aspect of Heislerville WMA, I present the pictures below -- all of which I took on 11 May (along with the pix above). Oh, and I like the photo ops, too! A BAR-TAILED GODWIT was seen at Brigantine NWR on Thursday, May 12th, 2011, but has not been reported since. 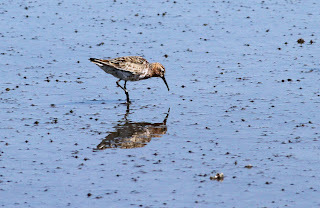 Two CURLEW SANDPIPERS have been frequenting the main impoundment of the Heislerville WMA: a female was last reported on Wednesday, May 11th, 2011, and an adult male was last seen on Thursday, May 12th, 2011. A SCISSOR-TAILED FLYCATCHER was located at the Plover Ponds in the Cape May Point State Park on Tuesday, May 10th, 2011. A WHITE-FACED IBIS has been seen along Stimpson’s Island Road, in a pond near the last house on the road, and was last reported on Friday, May 13th, 2011. A GLAUCOUS GULL was seen at the Second Avenue Jetty in Cape May on Wednesday, May 11th, 2011. A COMMON MOORHEN was observed at the east trail of the South Cape May Meadows on Thursday, May 12th, 2011. Twelve COMMON EIDERS were noted off of Sea Isle City on Thursday, May 12th, 2011. Two RED-BREASTED MERGANSERS and two RUDDY DUCKS were seen at Heslerville WMA on Friday, May 13th, 2011. The teams are moving in to Cape May for the World Series of Birding now and there's a definite buzz of excitement in the air. With more birders in town, there's more sightings coming in, so be sure to stop by the Northwood Center to find out the latest news. Don't forget we have a 'Swap-Meet' at our center at Goshen on Route 47, 7-9PM this evening for teams to exchange news and to find out where those tricky species are hiding - so do come along if you want the latest updates. A report from Jay McGowan of a White-faced Ibis at the end of Stipson Island Road, just inside the western border of Cape May County on the Delaware Bayshore, on Wednesday wasn't followed up with further reports, but it may still be around; Curlew Sandpiper reports come in daily from Heislerville impoundments on high tides - at least two different birds there it seems; a group of Common Eider was reported off Sea Isle City today and - perhaps most surprising of all - I was shown a photograph today of a Scissor-tailed Flycatcher, seen by the Plover Ponds at 5PM Wednesday night! Though there's been a long gap in the reports, it does seem as though this may well be the same bird still hanging out back in there some where. As May moves on, a trickle of nice migrants continues to arrive at the point, despite the annoyingly nice (!!) weather which remains warm and settled and is condusive to onward flight. The Northwood Center this afternoon had perched Common Nighthawk and a nice selection of songbirds that included Northern Waterthrush, American Redstart, Northern Parula and Blue-headed Vireo. Hey everyone! Christina Kisiel here, your friendly endangered and nongame state biologist, guest posting today to make a plea on behalf of NJ’s species of conservation concern. I work for the Department of Environmental Protection – Division of Fish and Wildlife –Endangered and Nongame Species Program (you know how the government loves to keep it simple- you can call it DEPDFWENSP for short, lol). In addition to the management and research that we do for the state’s threatened and endangered (T/E) species, we also are keepers of distribution data for these species. The data we collect are entered into our Biotics database and eventually makes its way our Landscape Project (LP). Detailed information about The Landscape Project can be found here but let me give you the CliffsNotes version. LP is the tool that we use to graphically represent the locations of species of conservation concern throughout the state. The maps that are generated through LP allow us to protect habitat through permits (it acts as a screening tool and allows regulators to address T/E concerns OR help developers avoid critter-heavy areas during planning stages), can help land trusts determine which properties to acquire (“Ohh, look how many T/E’s on this site! Buy it!”) and assist environmental commissions in managing habitat on a local scale. Of course, much of this data is sensitive (i.e. could be used to help poachers hone in on their targets) and care has been taken to protect the habitat while “hiding” the exact locations of the species, so fear not - your data would not be used against the species. But everyone knows a map is only as good as the data that built it. I am very proud to say that the LP is one of the best conservation tools in our arsenal. Our staff has dedicated considerable effort to ensuring that it is populated with as much verified and reliable data as we have. Data makes its way into LP in a few ways – it can be from staff members who input information from their own projects but also can be from the public, who vastly outnumber our staff members in bodies and area they can cover. It is because of the exceptional members of the bird-loving public (who I might add are among the finest looking and intelligent folks out there) that we have learned about countless nesting areas, foraging locations and roost spots (two-points if you guess where I am going here). As you are out scouring the birdiest sites in the state this week, please consider passing some of that information on to the state. The list of species we are most interested in (due to a combination of their conservation status and the lack of widespread information we currently have for them) can be found below and the report form can be found here. The contributions that you can make with this information are immeasurable – in addition to helping you raise thousands of dollars on the Big Day for conservation causes, you can help NJ’s biologists do a better job of mapping species and ultimately protecting the habitat they rely on to prosper in our delightful little corner of the planet. If you have any questions or comments regarding the submission of data, please feel free to contact me at ckisiel@hughes.net. Good luck this week WSBers! Thank you in advance for embracing the generous spirit common to birders and sharing the gift of your knowledge with us! Tony Leukering has been spending time this weekend watching the skies over the Rea Farm at the east end of Stevens Street, with some great results! A westerly element in the winds for several days now has no doubt played a part in the interesting raptor movements that have been taking place, not up to Fall standards, but still good for spring in Cape May. Tony's counts included over 100 Broad-winged Hawks over the weekend and an interesting count of 14 Bald Eagles on Sunday. Other counts included 138 Turkey Vultures on Saturday (presumed, wandering, non-breeding birds?) and six Northern Harriers on Sunday. Text messages and alerts mostly involved spasmodic glimpses of up to three Mississippi Kites which roamed Cape May Point over the weekend. Karl Lukens captured this shot of one of three Mississippi Kites that wandered Cape May Point over the weekend. As World Series draws closer and more birders head into town, there will doubtless be more news to come. It has to be said that songbird migration is a little quiet at the moment but last year, a fabulous fall of goodies descended on us right on Big Day weekend - so fingers crossed! I managed to take in a good number of the regular birding sites to be found on our CMBO Birding Maps this weekend and can confirm that there's plenty of birds out there. Nummy's Island at high tide is full of Red Knot as well as all the other expected shorebirds, including a Whimbrel on Sunday. 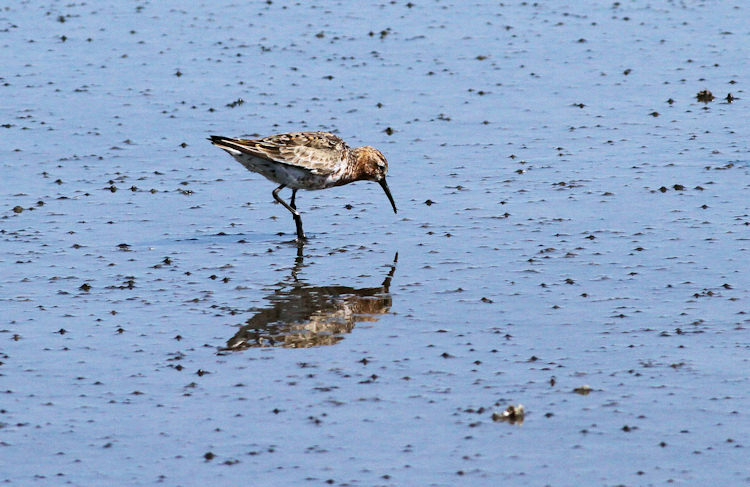 Up to two Marbled Godwits are being seen on and off at Two-Mile Landing, just south of Wildwood Crest and Heislerville is chock-full of birds, including intermittent sightings of a Curlew Sandpiper (check out our Heislerville reports in the Field Trip Reports section). A White Ibis was reported briefly from Benny's Landing on Sunday afternoon, but there's been no further reports (this site is off Bayberry Drive, just south of Stone Harbor Boulevard (Route 657), while a Pine Siskin seen heading West at Seagrove Avenue on Sunday morning would be a great bird for Big Day teams south of the canal if it could be pinned down at a feeder somewhere. Also on Sunday, a Western Willet flying past the point was a nice find. It's been a great spring here for the declining Red-headed Woodpecker; this one was on our Rea Farm walk on Saturday morning [photo by Karl Lukens]. The Glaucous Gull continues through today at 2nd Avenue Jetty and I can personally attest to Black-throated Blue Warbler and Baltimore Oriole outside the Northwood window right now! Non-bird news of late includes a great show of butterflies throughout the county right now, but especially at Belleplain, where Red-banded, Gray and Juniper Hairstreaks are on the wing, Spicebush Swallowtails are bounding along the back lanes and all four species of elfin can be found with a bit of searching. Tony Leukering reported at least two Spot-winged Gliders passing through over the weekend (a good early date for this migrant species - the NJodes website gives May 13th as the earliest date) and a migratory Red Bat also dropped into the trees at the Rea Farm - an increasingly scarce species here these days. Red-banded Hairstreak (top) and Juniper Hairstreak (bottom) are both out there waiting to be found right now. Look for them nectaring at Flowering Dogwood bushes in Belleplain State Forest [photos by Mike Crewe]. Keep an eye on the ground too; Moccasin-flower (or Pink Ladies-slipper Orchid) seems to be having a good year this year and is flowering at a number of sites in middle and upper parts of Cape May County [photo by Mike Crewe].